The Hoffmann Law Firm represents victims of construction zone accidents in Missouri and Illinois. Although the speed limit in construction zones is usually significantly reduced and traffic is generally well-contained, accidents can, and do, arise. Signs and equipment obstructing a driver’s view, unclear definition of lanes, and large numbers of cars on the roadway are just a few factors that may contribute to a construction zone accident. In order to reduce your risk of an accident, it is important to pay close attention to the posted speed limit when you are driving in a construction zone. In addition, it is important to pay even more than the usual attention to your surroundings. Because you may be driving in a more confined space, possibly with workers and heavy machinery close by, even a minor distraction can lead to disaster. 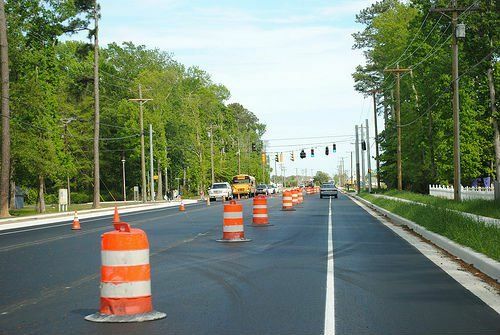 There are State and Federal regulations in place to ensure that construction zones are properly maintained, to avoid exposing drivers to dangers that would otherwise not exist. Contractors have a legal responsibility to ensure that drivers are warned of potential dangers that arise as a result of a construction project by using signs or temporary roadway markings. However, sometimes a contractor’s desire to finish a project as quickly as possible takes precedence over their obligation to make sure the construction site is safe. If this is the case, they should be held accountable for any car accidents that happen as a result. Construction zone accidents can be confusing. For example, if you are injured in a construction zone accident it may be difficult figuring out who is legally responsible for compensating you for any injuries or damages you may have sustained. To receive legal assistance it is important to contact a personal injury attorney who specializes in car accidents. At The Hoffmann Law Firm our experienced legal team is determined to protect the rights of personal injury victims in Missouri and Illinois.